OpenMUC is a software framework based on Java and OSGi that simplifies the development of customized monitoring, logging and control systems. It can be used as a basis to flexibly implement anything from simple data loggers to complex SCADA systems. The main goal of OpenMUC is to shield the application developer of monitoring and control applications from the details of the communication protocol and data logging technologies. Third parties are encouraged to create their own customized systems based on OpenMUC. OpenMUC is licensed under the GPL. If you need an individual license please contact us. For a short overview of OpenMUC’s goals and features please visit our overview page. This guide is a detailed documentation on how OpenMUC works and how to use it. This chapter gives you a practical introduction into OpenMUC. It just takes a few steps to get OpenMUC running and you can play around with it. If you are more interested into technical details you could proceed with the Architecture chapter instead. To install OpenMUC just download the latest version and unpack it to your favourite destination. OpenMUC requires Java 7 or higher, therefore make sure it is installed on your machine. 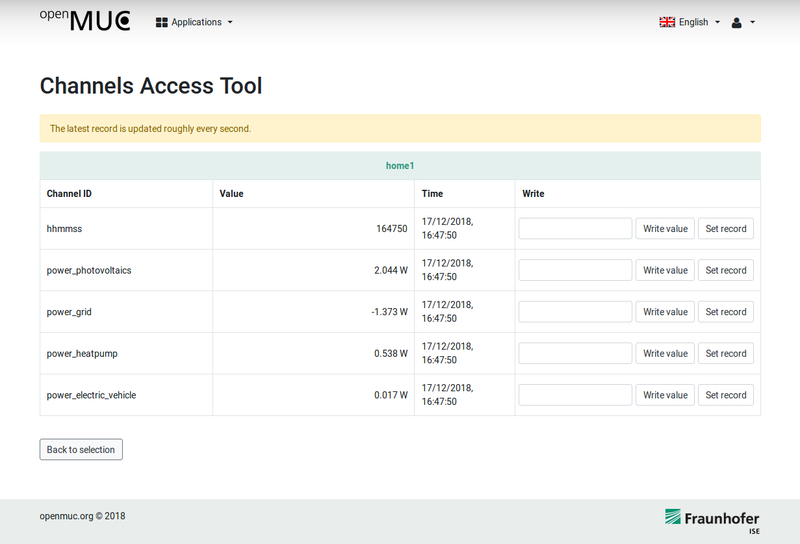 The OpenMUC demo contains a simple application which demonstrates how you can access channels and their records from an application. The application reads data from channels of the CSV driver, calculates new values from them and writes them to other channels. 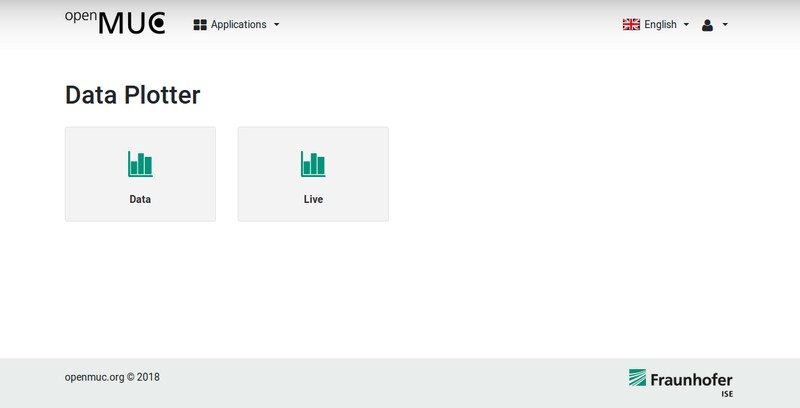 The application can be used as starting point to create your own OpenMUC application. This will start the Apache Felix OSGi framework which in turn starts all the bundles located in the “bundle” folder. 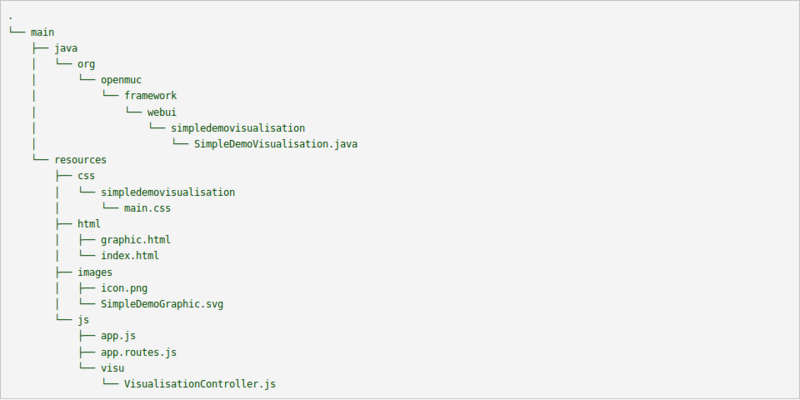 After initialization of the OSGi framework you should be able to see the output of the demo application. Among the bundles that are started is the Apache Gogo shell. This shell is entered once you run OpenMUC. Now type “lb” to list all installed bundles. You will see that among the active bundles are the Simple Demo App, the OpenMUC core bundles, two data loggers (ASCII and SlotsDB) as well as the CSV driver. The shell can be used to start, stop, and reload bundles among other things. You can stop and exit the OSGi framework any time by typing “ctrl+d” or “stop 0”. For more information about the start script see chapter OpenMUC start script. Once OpenMUC is running, open a browser (works currently best with Google Chrome) and enter the URL “http://localhost:8888” or “http://127.0.0.1:888”. This leads you to the login page of OpenMUC’s WebUI. The default user is admin and the default password is admin as well. After successful login the OpenMUC Dashboard opens, which provides various plugins for configuration and visualization. A full description of the plugins can be found in the chapter Web UI. Let us first look at the Channel Access Tool which provides the current value of each channel and also enables you to write values. Click on Channel Access Tool to open this plugin. The next page lists all available devices which are currently configured in OpenMUC. Select the home1 and proceed with Access selected. On the next page you will see the latest records of all channels of home1. Each record consists of a data value, a timestamp when it was sampled and a quality flag. Let’s have look at the Data Plotter. To get to the Data Plotter click on Applications next to the OpenMUC logo and select Data Plotter. Select the Live Data Plotter. To view the live data select the channels of your choice and click Plot Data. The last WebUI plugin we want to look at is a customised visualisation for our demo application. Click on Applications and select Simple Demo Visualisation. The purpose of this plugin is to show how OpenMUC channels can be accessed and used for individual visualisations. Detailed informations about the development of such a plugin can be found in the Tutorial Develop a Customised WebUI Plugin. All channels currently defined get their data using the CSV driver from the file “csv-driver/home1.csv”. That file contains additional data. 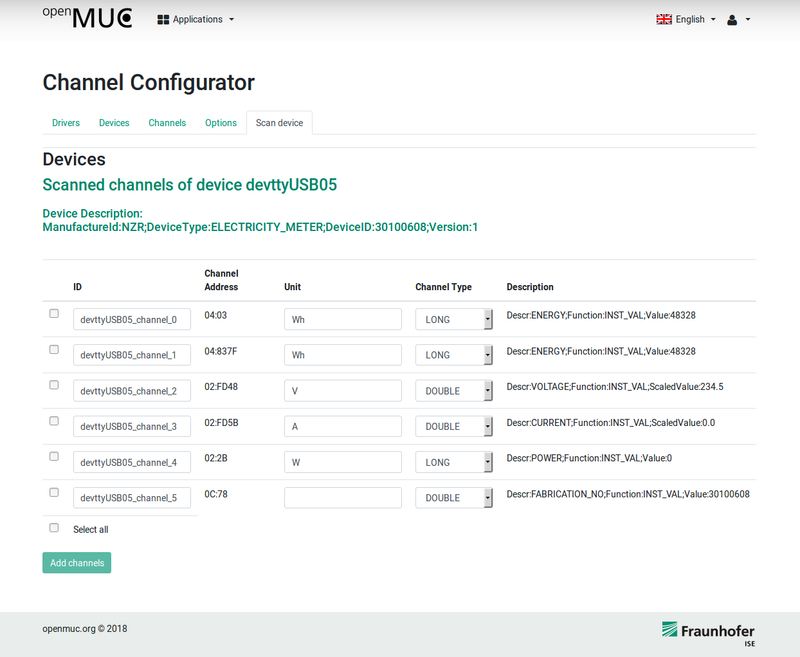 So let us now add a new channel to the OpenMUC configuration using the channel scan feature. 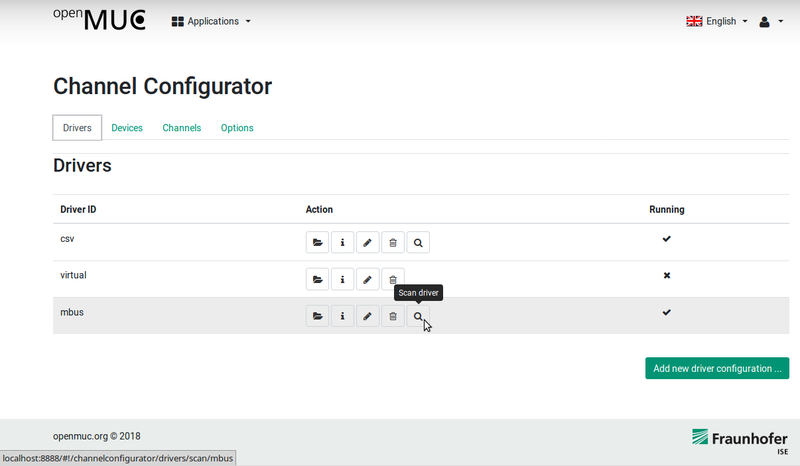 In the WebUI go to the Channel Configurator. Click the tab “Devices”. In the row of device “home1” click on the search/scan icon. It shows you all the channels available in that device. Once the scan has completed a list of available channels is shown. In this tutorial we select the channel with address “pv_energy_production”. Click “add channels”. Now the channel overview opens where we can find our selected channel. In the last step of the configuration we click on the edit icon of the channel and set the parameters logging interval and sampling interval to 5000 ms and change the unit to kWh. You can now check that the new channel was added to the “conf/channels.xml” file. After submitting the channel configuration we go back to the dashboard and open the Channel Access Tool. Here we select our home1 device and continue with access selected. Now we able to see the current values of the pv_energy_production channel. Objective: You will learn how to create a simple data logger which reads out a M-Bus meter via serial communication. It uses OpenMUC on-board tools so no programming is required. Preparation: If not already done, your system needs to be prepared once for serial communication. Now logout from your system and login again to apply system changes. osgibundles group: "org.openmuc", name: "jrxtx", version: "1.0.1"
Open a browser and point it to localhost:8888 to view the WebUI of OpenMUC. Login with user admin and password admin. Enter the serial port the meter is connected to and provide the baud rate if needed (e.g. /dev/ttyS0 or /dev/ttyS0:2400). See M-Bus driver section for more information. 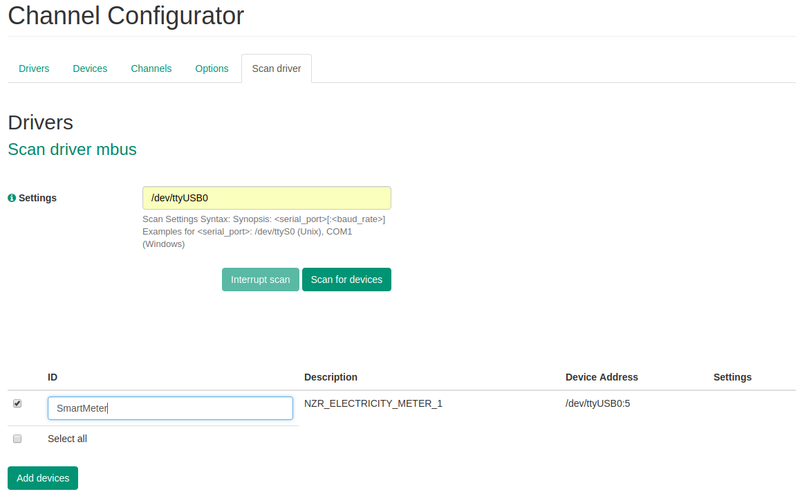 If you are using an USB device you can use the dmesg tool on linux to figure out on what port it is connected (e.g. /dev/ttyUSB0). Objective: You will learn how to develop your own OpenMUC application. This tutorial focuses on the Eclipse integration, build process and how to start your application in the felix OSGi framework. Preparation: This tutorial is based on Eclipse IDE and Gradle build tool, therefore you need Eclipse IDE and Gradle installed on your pc. Create a new project based on the simple demo application. Navigate to openmuc/projects/app and copy the simpledemo folder and rename the copy to ems (Energy Management System). Edit the build.gradle file inside your ems folder. Rename the project name and description and save the file. 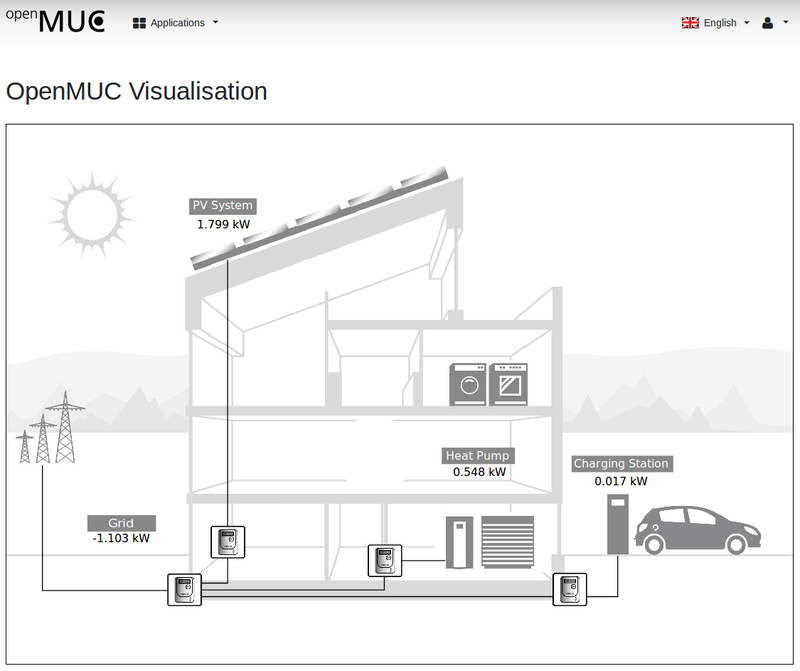 description "OpenMUC Energy Management System." Replace the SimpleDemoApp.java inside this ems folder with EmsApp.java. 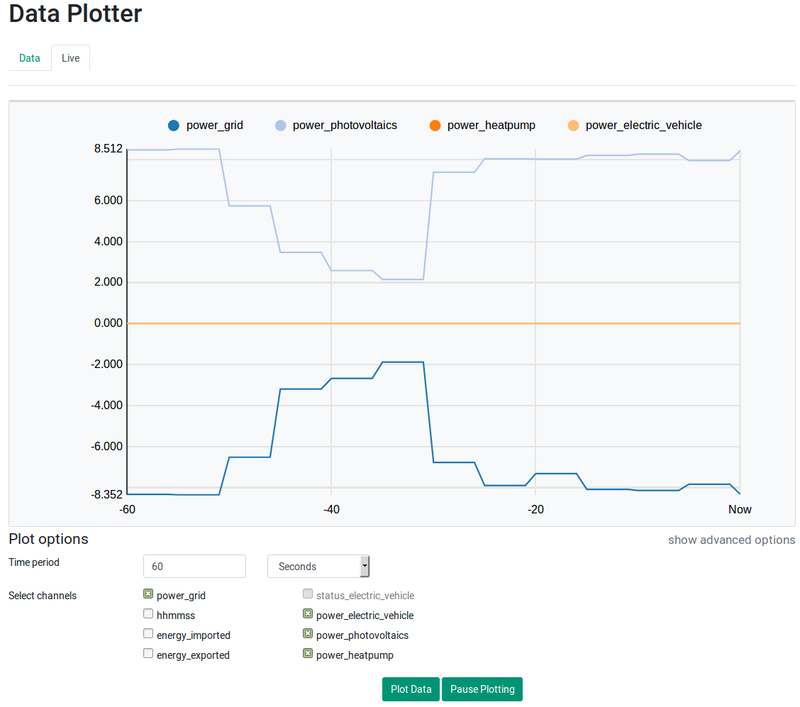 This is a light version of the simple demo application and basically adds a listener to the power_grid channel and logs the current value. This class can be used for further development of your application. Import the Openmuc projects into Eclipse: Go to File>Import>General>Existing Projects into Workspace, select your OpenMUC directory and click on Finish. All projects should be imported without any errors. Now you know all the steps to build a new application and get it running in OpenMUC. For further development you should have a look at the source code of the SimpleDemoApp.java. This tutorial describes how we developed the simpledemovisualisation. When creating your own plugin you can just replace the name simpledemovisualisation whenever it comes up in the tutorial. Preparation: You should be familiar with OpenMUC’s architecture. def projectName = "OpenMUC WebUI - Simple Demo Visualisation"
def projectDescription = "Simple Demo Visualisation plug-in for the WebUI of the OpenMUC framework." The two functions getAlias and getName have to be overridden. The alias is used to identify the plugin while the name will be displayed in the WebUI. In order to display an icon above the plugin’s name, the file needs to be called icon and put in the images folder. Next we will take a look at app.js and app.routes.js. In app.js all we do is creating a module and naming it. The more interesting one is app.routes.js because it is responsible for allowing us to get from the main page to the page of our plugin. It also allows us to specify which files have to be loaded. For the Plugin created in this tutorial we will need an svg that is put into the image folder. The SimpleDemoGraphic.svg used in this tutorial is made up of multiple images, paths as well as text fields. In this case only the text fields are of interest. The two html files used in this app are very simple, index.html sets the headline and then calls on graphic.html through ui-view. Ui-view calls upon the route defined in app.routes.js. In graphic.html we create a div element and assign it the class svg-container. We then create an object HTML element inside the div and assign it the class svg-content. In order to specify how our page should be displayed we use a css file. In this css file we tell the browser how the html elements should look and be positioned. If the declaration starts with a dot it signifies all elements with the specified class being targeted, a hash would signify an element with that Id being targeted and nothing signifies all html elements of that type should be targeted. We cannot change the css of the svg from our css file so we have to do it inside the svg. Here we “import” the angular functions $scope and $interval as well as the class ChannelsService. Next we take a look at the function display_visualisation that is called when the html page loads. What follows is defined inside this interval, meaning it will be repeated every 500 milliseconds. Here we call the function getAllChannels of the class ChannelsService. It makes a get call to the REST server and returns all the channels defined in the channels.xml. The “then” means that whatever is in the round brackets will be executed after getAllChannels' return value arrives. Inside these round brackets we define an async function with getAllChannels' return value as a parameter. The list records of the return value contains the requested channels, so we save them in the list $scope.channels. Normally the rest of the code would be exectued while getAllChannels waits for a reply, in which case our code would fail as $scope.channels would be undefined, but the await keyword in conjunction with marking the function as async makes it so the code only resumes executing once the await has been resolved. First we check if our list is not undefined as it is possible that during the first interval there wont be any data to work with. Now we iterate through our channels list to find the channels we need. Once we found the right channel, we search for the corresponding text field and save the reference to it in a variable. By setting the textContent of the text field we can change what is displayed, in this case the channel’s value is displayed in the text field. Now we set the interval and close the function definition as shown above. After that we tell the function to stop the interval if the scope’s destroy event is triggered and that the in app.js defined module should use this controller. The following image depicts the software layers of an OpenMUC system. The OpenMUC framework runs within an OSGi environment which in turn is being run by a Java Virtual Machine. The underlying operating system and hardware can be chosen freely as long as it can run a Java 7 VM. OpenMUC consists essentially of various software modules which are implemented as OSGi bundles that run in the OSGi environment and communicate over OSGi services. The following figure illustrates the main modules that make up OpenMUC. All modules except for the data manager are optional. Thus by selecting the modules you need you can easily create your own customized and lightweight system. The data manager represents the core and center of OpenMUC. Virtually all other OpenMUC modules (e.g. drivers, data loggers, servers, applications and web interface plugins) communicate with it through OSGi services. The data manager gets automatically notified when new drivers or data loggers get installed. 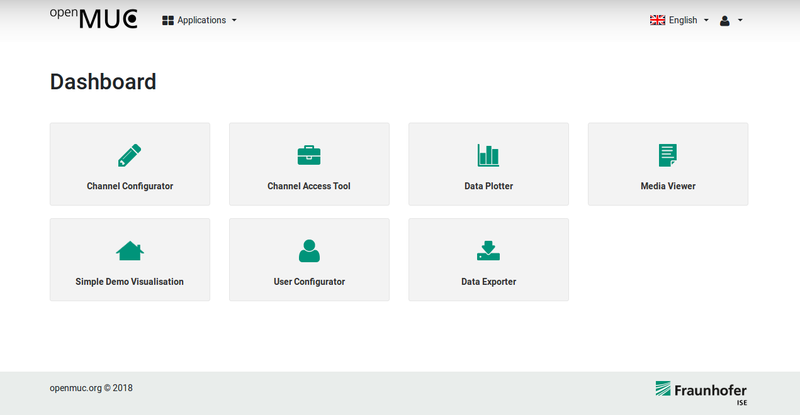 OpenMUC applications communicate with devices, access logged data or change the configuration by calling service functions provided by the data manager. It is therefore the data manager that shields the application programmer from the details of the communication and data logging technology. What the data manager does is mostly controlled through a central configuration. when to send sampled data to existing data logger(s) for efficient persistent storage. The configuration is stored in the file conf/channels.xml. You may add or modify the configured channels by manually editing the channels.xml file or through the channel configurator web interface. 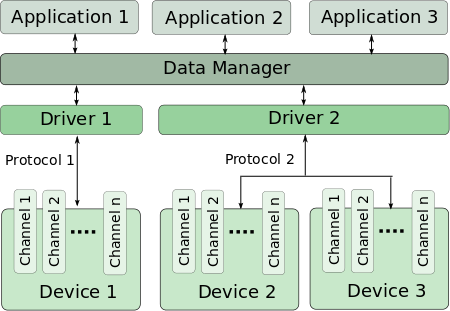 A driver is used by the data manager to send/get data to/from a connected device. Thus a driver usually implements a communication protocol. Several communication drivers have already been developed (e.g. 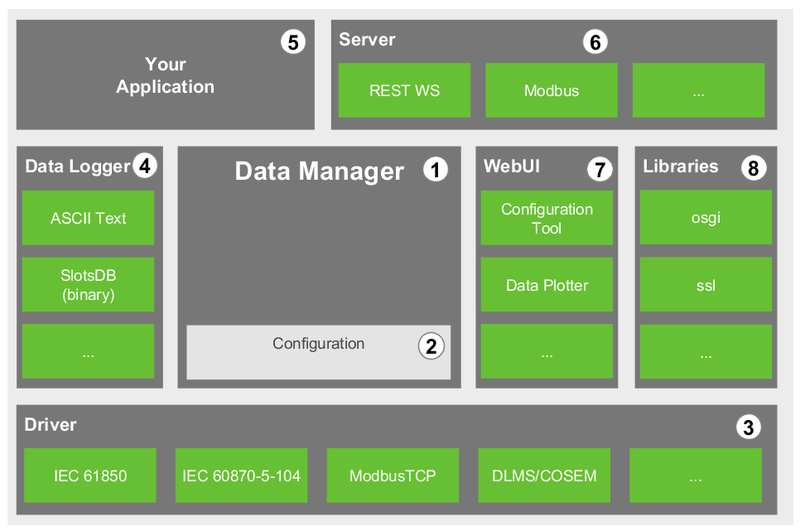 IEC 61850, ModbusTCP, KNX, DLMS/COSEM). Many drivers use standalone communication libraries (e.g. OpenIEC61850, jMBus) developed by the OpenMUC team. These libraries do not depend on the OpenMUC framework and can therefore be used by any Java application. New communication drivers for OpenMUC can be easily developed by third parties. A data logger saves sampled data persistently. The data manager forwards sampled data to all available data loggers if configured to do so. Data loggers are specifically designed to store time series data for short storage and retrieval times. Note that this usually means that they are not SQL-based. OpenMUC currently includes two data loggers. The ASCII data logger saves data in a human readable text format while SlotsDB saves data in a more efficient binary format. If all you want is sample and log data then you can use the OpenMUC framework as it is and simply configure it to your needs. But if you want to process sampled data or control a device you will want to write your own application. Like all other modules your application will be an OSGi bundle. 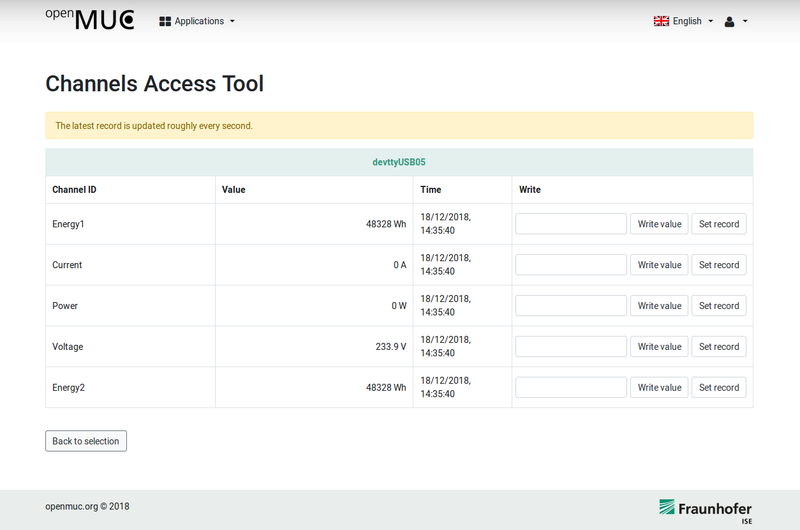 In your application you can use the DataAccessService and the ConfigService provided by the data manager to access sampled and logged data. You may also issue immediate read or write commands. These are forwarded by the data manager to the driver. The configuration (when to sample and to log) can also be changed during run-time by the application. At all times the application only communicates with the data manager and is therefore not confronted with the complicated details of the communication technology being used. If your application is located on a remote system (e.g. a smart phone or an Internet server) then the data and configuration can be accessed through an OpenMUC server. At the moment OpenMUC provides a RESTful web service for this purpose. Finally the OpenMUC framework provides a web user interface (WebUI) for tasks such as configuration, visualization of sampled data or exporting logged data. The web interface is modular and provides a plug-in interface. This way developers may write a website that integrates into the main menu of the web interface. The WebUI is mostly for configuration and testing purposes. Most companies will want to create their own individual UI. Information on the external dependencies of the OpenMUC framework. Also contains the RXTX library (repacked as a bundle) which is needed by many OpenMUC drivers based on serial communication. All sources of the OpenMUC framework. You can easily change and rebuild OpenMUC using Gradle. A ready to use OpenMUC demo framework that is introduced next. The main Apache Felix OSGi jar which is run to start OpenMUC. Run scripts for Linux/Unix and Windows. Contains all bundles that are started by the Felix OSGi framework. Note that this folder does not contain all available OpenMUC bundles but only a subset for demonstration purposes. Log files produced by the running framework. Various configuration files of the framework. OpenMUC works on the basis of channels. A channel basically represents a single data point. Some examples for a channel are the metered active power of a smart meter, the temperature of a temperature sensor, any value of digital or analog I/O module or the some manufacture data of the device. Thus a channel can represent any kind of data point. The following picture illustrates the channel concept. The conf/channels.xml file is the main configuration file for OpenMUC. It tells the OpenMUC framework which channels it should log and sample. It contains a hierarchical structure of drivers, devices and channels. A driver can have one or more devices and devices can have one or more channels. Following listing shows a sample configuration to illustrate the hierarchical structure. The driver, device and channel options are explained afterwards. Default time waited for a read operation to complete if the device doesn’t set a samplingTimeout on its own. Default time waited until a failed connection attempt is repeated. While disabled, no connections to devices on this driver are established at all and all channels of these devices stop being sampled and logged. Address for the driver to uniquely identify the device. Syntax of this address is up to the driver implementation. Additional settings for the driver. Syntax is up to the driver implementation. Time waited for a read operation to complete. Overwrites samplingTimeout of Driver. Time waited until a failed connection attempt is repeated. While disabled, no connection of this device is established and all channels of this device stop being sampled and logged. Globally unique identifier. Used by data logger implementations. The OpenMUC framework automatically generates an id if none is provided. The channelAddress is driver specific and contains the necessary parameters for the driver to access. Data type of the channel. Used on data logger. Driver implementation do NOT receive this settings! The attribute length is only used if valueType is BYTE_ARRAY or STRING. Determines the maximum length of the byte array or string. Is used to offset a value read by a driver or set by an application. The offset is added to a value read by a driver and subtracted from a value set by an application. Time difference until this channel is logged again. -1 or omitting loggingInterval disables logging. Determines if this channel shall passively listen for incoming value changes from the driver. Time interval between two attempts to read this channel. -1 or omitting samlingOffset disables sampling on this channel. For grouping channels. All channels with the same samplingGroup and same samplingInterval are in one group. The purpous of samplingGroups is to improve the drivers performance – if possible. If a channel is disabled, all sampling and logging actions of this channel are stopped. *time: integer with suffix (ms, s, m, h) like: 300ms, 2s. The available driver settings, device settings and channel settings can also be found in the Javadoc of DriverConfig.java, DeviceConfig.java and ChannelConfig.java respectively. You can define a default data logger by adding a logger element with the id of a data logger to the configuration. If available, that data logger is used to read logged values. The ids of data loggers shipped with the OpenMUC Framework are defined in the “Data Loggers” chapter. If no logger with the defined id is available, or the logger element is missing from the configuration, an arbitrary available logger is used to read logged values. Only one default logger may be defined. If multiple logger elements exists, only the first one is evaluated. This configuration only affects reading of already logged values. Channels are still logged by all available loggers. sampling is when the data manager frequently asks a driver to retrieve a channel value. listening is when the driver listens on a channel and forwards new values to the data manager. The following examples will give you a better understanding of these three settings. In example 1 the channel is sampled every 4 seconds which means the data manager requests every 4 seconds the current value from the driver. Example 2 extends example 1 by an additional logging. The logging interval is set to 8 seconds which means that every 8 seconds the last sampled value is stored in the database. In this case every second sampled value is stored because the sampling interval is 4 seconds. To log every sampled value the sampling interval and logging interval need to be the same. In example 3 listening instead of sampling is used. This means that the driver reports a new channel value to the data manager when the value has changed for example. Example 4 extends example 3 by an additional logging. When listening is true and additional a sampling interval is defined then the sampling is ignored. The Linux start script is a sophisticated bash script that can be used to start, stop, restart OpenMUC. The Windows run script is a simple bat file that starts OpenMUC. The following explanations will focus on using OpenMUC in a Linux environment as it is the more common scenario. The Felix OSGi Framework will then start all bundles located in the “bundle” folder. When you start OpenMUC in the foreground you will enter the Felix Gogo shell. From the shell you can start, stop and reload bundles among many other things. To quit the shell and stop the framework press ctrl+d or enter “stop 0”. Pressing ctrl+d will exit the remote shell but not stop the openmuc framework. To update the bundles in the bundle folder after e.g. changing bundles.conf.gradle Before using this the first time see the next point. The above solution will not work if the openmuc start script is located on a partion that is not yet mounted at the time the boot process attempts to open it. In this case you need copy the start script to /etc/init.d/ and edit it to set the OPENMUC_HOME variable. For installing a new driver you have two possible ways. Copy the corresponding driver jar file from the folder “build/libs-all/” to the “bundle” folder of the framework. Many drivers are “fat jars” which include their dependencies. An exception is the RXTX library which cannot be packed with the jars. osgibundles group: "org.openmuc",           name: "jrxtx",               version: "1.0.1"
When you need to use a driver that uses serial communication you have to copy the RXTX bundle to the frameworks “bundle” folder. The Modbus driver supports RTU, TCP and RTU over TCP. The DeviceAddress is specified by an IP address and an optional port. If no port is specified, the driver uses the modbus default port 502. The DeviceAddress is specified by a serial port like /dev/ttyS0. The ChannelAddress consists of four parts: UnitId, PrimaryTable, Address and Datatyp which are explained in detail in the following table. On TCP/IP, the MODBUS server is addressed by its IP address; therefore, the MODBUS Unit Identifier is useless. The value 255 (0xFF) has to be used. This field is used for routing purpose when addressing a device on a MODBUS+ or MODBUS serial line sub-network. In that case, the “Unit Identifier” carries the MODBUS slave address of the remote device. The MODBUS slave device addresses on serial line are assigned from 1 to 247 (decimal). Address 0 is used as broadcast address. Note: Some MODBUS devices act like a bridge or a gateway and require the UnitId even if they are accessed through TCP/IP. One of those devices is the Janitza UMG. To access data from the Janitza the UnitId has to be 1. Address of the channel/register. Decimal integer value – not hex! Since COILS and DISCRETE_INPUTS are used for bit access, only the data type BOOLEAN makes sense in combinations with of one of these. 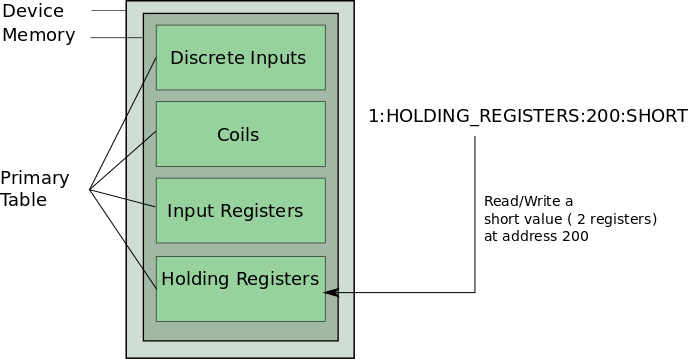 INPUT_REGISTERS and HOLDING_REGISTERS are used for register access. There is also a difference between reading and writing. Only COILS and HOLDING_REGISTERS are readable and writable. DISCRETE_INPUTS and INPUT_REGISTERS are read only. The following table gives an overview of valid parameter combinations of PrimaryTable and Datatyp. The driver is based on the Java Modbus Library (jamod) which provides read and write access via modbus. Following table shows which modbus function code is used to access the data of the channel. If you want to use the Modbus TCP driver for accessing a Wago device you first need to know how the process image is build. From the process image you can derive the register addresses of your Wago modules (AO, AI, DO, DI). 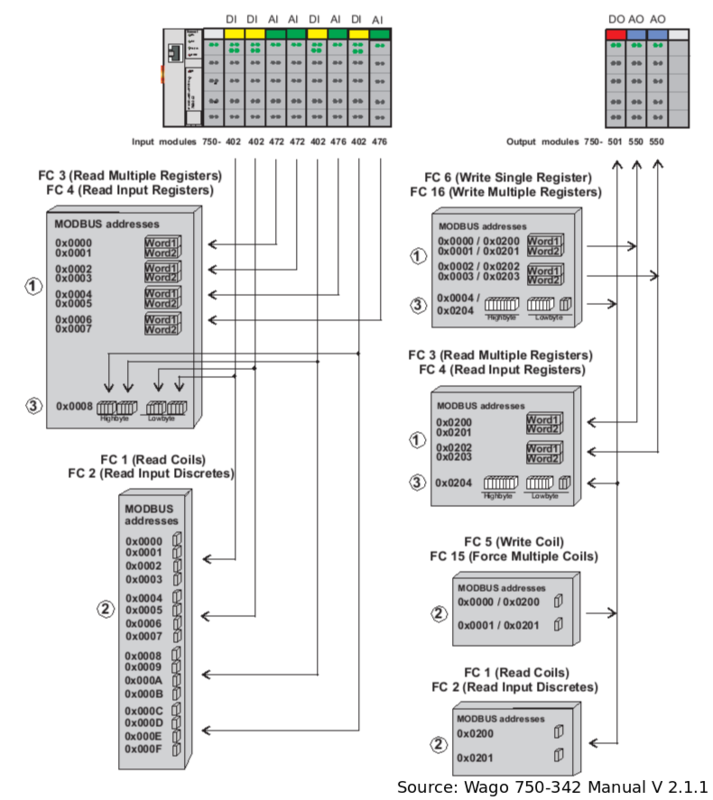 You find detailed information about the process image in WAGO 750-342 Manual on page 46 and 47. M-Bus is communication protocol to read out meters. <serial_port> – The serial port should be given that connects to the M-Bus converter. (e.g. /dev/ttyS0, /dev/ttyUSB0 on Linux). Wireless M-Bus is communication protocol to read out meters and sensors. <transceiver> – The transceiver being used. It can be 'amber' or 'rc' for modules from RadioCrafts. <mode> – The wM-Bus mode can be S or T.
<key> – The key in hexadecimal form. IEC 60870-5-104 is an international communication standard for telecontrol. The IEC 60870-5-104 driver uses the library from the j60870 project. The driver is able to send general interrogation commands for sampling. For writing almost all commands are possible. All options are separated by a semicolon. Mandatory options are Common Address, Type ID and Information Object Address. For reading values which are divided in multiple elements it can be defined how many elements should be read as one. e.g. i=0;m=4 says it reads from the first element up to the fourth element, of a sequence. This is only allowed for Binary State Information. With the option Data Type it is possible to get a single quality flag. IEC 61850 is an international communication standard used mostly for substation automation and controlling distributed energy resources (DER). The IEC 61850 driver uses the client library from the OpenIEC61850 project. The channel address should be the IEC 61850 Object Reference and the Functional Constraint of the Basic Data Attribute that is to be addressed separated by a colon. Note that an IEC 61850 timestamp received will be converted to a LongValue that represents the milliseconds since 1970. Some information is lost during this conversion because the IEC 61850 timestamp is more exact. The defaults for TSelLocal and TSelRemote are “00” and “01” respectively. You can also set either TSelector to the empty string (e.g. “-lt -rt”). This way they will be omitted in the connection request. Baud rate change delay -d sets the waiting time in milliseconds between a baud rate change default is 0. Timeout -t sets the response timeout in milliseconds, default is 2000. Number of read retries -r defines the maximum of read retries, default is 0. Baud rate -bd sets a initial baud rate e.g. for devices with modem configuration, default is 300. Device address -a is mostly needed for devices with RS485, default is no device address. Fixed baud rate -fbd activates fixed baud rate, default is deactivated. Request message start character -rsc is used for manufacture specific request messages. With this option you can change the default start character. Read standard -rs reads the standard message and the manufacture specific message. This options has only an affect if the Request message start character is changed. <data_set_id> – Id of the data set. It is usually an OBIS code of the format A-B:C.D.E*F or on older EDIS code of the format C.D.E.that specifies exactly what the value of this data set represents. DLMS/COSEM is a international standardized protocol used mostly to communicate with smart meter devices. The DLMS/COSEM driver uses the client library developed by the jDLMS project. Currently, the DLMS/COSEM driver supports communication via HDLC and TCP/IP using Logical Name Referencing to retrieve values from the device. The interface address consists of all elements the driver needs to uniquely identify and address a physical smart meter and format depends on the used protocol. Refer to the following table for the format of the interface address. Settings are separated by a semi-colon. The available settings are determined by the used protocol, defined as first parameter of the device address. All possible settings with a short description and default values are listed in the following table. KNX is a standardised protocol for intelligent buildings. The KNX driver uses KNXnet/IP to connect to the wired KNX BUS. The driver supports group read and writes and is also able to listen to the BUS. The driver uses the calimero library. The device address consists of the host IP and the IP of the KNX tunnel or router. The channel address consist of the group address you want to monitor and the corresponding data point ID. A data point consists of a main number and a subtype. For example a boolean would be represented by the main number 1 and a switch by the subtype 001, the DPT_ID of a switch is 1.001.
scanForDevices() and scanForChannels will return the specific configuration. Simple Network Management Protocol (SNMP) is an Internet-standard protocol for monitoring and management of devices on IP networks. IP address and available SNMP port of the target device should be provided as Device Address. All settings are stored in “SnmpDriverSettingVariableNames” enum. In order to read specific channel, corresponding SNMP OID shall be passed. For scanning SNMP enabled devices in the network, range of IP addresses shall be provided. This functionality is implemented only for SNMP V2c. The csv driver supports sampling from a csv file. This feature can be very helpful during application development or show cases, when no real hardware is available. For example, our SimpleDemoApp uses data provided by the csv driver. line – starts sampling from the first line of the csv file. Timestamps are ignored and each sampling reads the next line. unixtimestamp – csv file must contain a column with the name unixtimestamp, values must be in milliseconds. During sampling the driver searches the closest unixtimestamp which is >= the sampling timestamp. Therefore, the driver keeps returning the same value for sampling timestamps which are before the next unixtimestamp of the csv file. hhmmss – csv file must contain a column with the name hhmmss and the time values must be in the format: hhmmss. rewind – If true and the last line of the csv file is reached, then the driver will start sampling again from first line. This option can only be used in combination with sampling mode hhmmss or line. The columns unixtimestamp and hhmmss are part of the log files created by the AsciiLogger, therefore the csv driver supports these files. The Aggregator which performs aggregation of logged values from a channel. It uses the DriverService and the DataAccessService. It is therefore a kind of OpenMUC driver/application mix. The aggregator is fully configurable through the channels.xml config file. Channel A (channelA) is sampled and logged every 10 seconds. The new (aggregated) channel has the id channelB. The channel address consists of the channel id of the original channel and the aggregation type which is channelA:avg in this example. OpenMUC calls the read method of the aggregator every minute. The aggregator then gets all logged records from channelA of the last minute, calculates the average and sets this value for the record of channelB. NOTE: It’s recommended to specify the samplingTimeOffset for channelB. It should be between samplingIntervalB – samplingIntervalA and samplingIntervalB. In this example: 50 < offset < 60. This constraint ensures that values are AGGREGATED CORRECTLY. At hh:mm:55 the aggregator gets the logged values of channelA and at hh:mm:60 respectively hh:mm:00 the aggregated value is logged. Driver to connect an OpenMUC instance with an remote OpenMUC instance with REST. Connecting to an remote OpenMUC instance (192.168.8.18:8888) and reading the channel “power_grid” every 5s if the timestamp has changed. Plugin to show current values of selected channels. Provides possibility to set values. The servlet context root of the OpenMUC WebUI can be configured, by setting the org.apache.felix.http.context_path system property. This must be a valid path starting with a slash and not ending with a slash (unless it is the root context). You can access the WebUI over https as well: https://localhost:8889. To make the framework more secure you could disable http by setting org.apache.felix.http.enable in the conf/system.properties file to false. You can include your own Plugins in the OpenMUC WebUI by creating a java class that extends the WebUiPluginService. This class also has to be annotated as a component. The two functions getAlias and getName have to be overridden. The alias is used to identify the plugin while the name will be displayed in the WebUI. In order to display an icon above the plugins name, the file needs to be called icon and saved under samplePlugin/src/main/resources/images. Now you can manipulate the Elements of the svg, the easiest way to do this is through getElementById for a single Element or getElementsByClass for multiple Elements. Aside from changing what is displayed you can also manipulate the css in this way. The following example would change the displayed texts color to blue. The openmuc-server-restws bundle manages a RESTful web service to access all registered channels of the framework. The RESTful web service is accessed by the same port as the web interface mentioned in Chapter 2. Bundle that provides an org.osgi.service.http.HttpService service. In the demo framework, that service is provided by the org.apache.felix.http.jetty bundle. This bundles is already provided by the demo framework. The RESTful web service will start automatically with the framework without additional settings. You can access logged values of a channel by adding '/history?from=fromTimestamp&until=untilTimestamp' to the channel address, fromTimestamp and untilTimestamp are both milliseconds since Unix epoch (1970-01-01 00:00:00). The result is a collection of records encoded as JSON. New records can be written to channels by sending a PUT request at the address that represents a channel. The data in the put request is a record encoded as specified in Record JSON above. If HTTPS is used to access the REST server then HTTP basic authentication is required. The login credentials are the same as the one used to log into the web interface of the OpenMUC Framework. The modus service allows you to access to a OpenMUC channel by ModbusTCP protocol. For accessing a channel through Modbus the channel has to be mapped with serverMapping and the Modbus Server bundle has to copied in the bundle folder. DISCRETE_INPUTS and COIL are not supported yet. Server settings are done in the system.properties. If you run ModbusTCP Server without root-privileges you have to allow Felix to bind Port 502 with setcap.